This is another dish based on the theme that we “rediscovered” our juicer. After making fresh carrot juice, we remembered that I used to make shrimp in curry flavored reduced carrot juice. My wife thought she knew where the recipe came from but could not find it. Web search did not yield anything similar. So I decide to make this dish from my memory (or whatever was left of it). I first thawed the shrimp under running water. I salted the shrimp and let it rest for 10-15 minutes in a colander. I removed the shells (these were already deveined) and set the shrimp and shells aside. I sautéed the ginger in olive oil with one thin pat of butter. 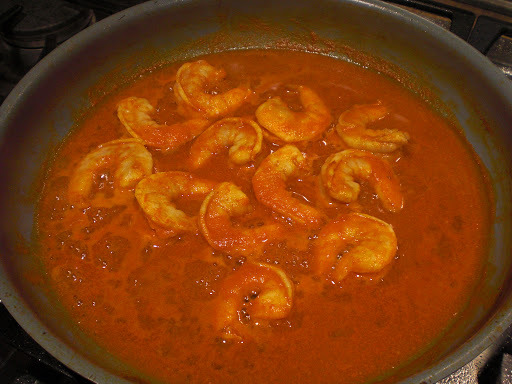 I then added the curry powder and mixed until fragrant, I added the shrimp shells and sautéed until the color changed. I added sake and reduced it in half and removed the shrimp shells. I then added the carrot juice and simmered/reduced it by half stirring occasionally (20 minutes or longer). When the juice attained a thick and saucy consistency, I added the shrimp and cooked for 20-30 seconds on each side turning once until the shrimp was cooked. I swirled in a few thin pats of butter to finish the sauce. (Taste and if need add more salt. I did not since the shrimp was well seasoned). I served this with couscous and garnished it with chopped parsley. This is a very nice dish. The sweetness of the freshly made carrot juice and curry flavor went so well together. 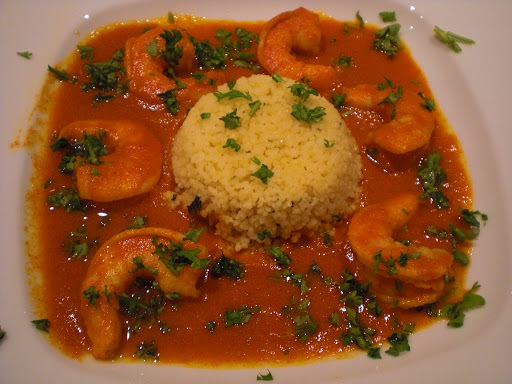 Although shrimp were frozen, the dish was not bad at all.